Ve a customer web portal (www.hum.com). 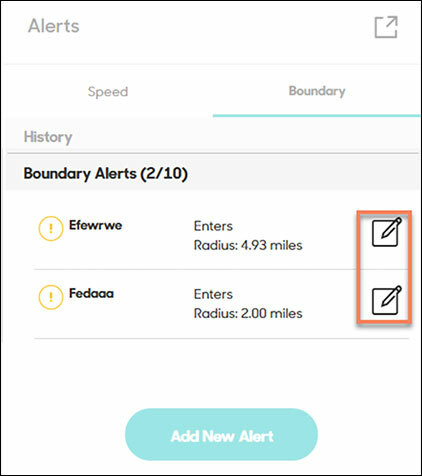 From the Alerts section on the HUM Dashboard (located to the right of the map), click the Boundary tab. Click the Edit icon for the appropriate alert to be edited (located to the right of the alert name). Click the desired area on the map to set a boundary circle. If preferred, use the Search bar to enter an address or place name. Use the + and - buttons (located on the bottom-right of the map) to re-size the map. Enter a preferred name for the alert, (e.g., Billy leaving school). 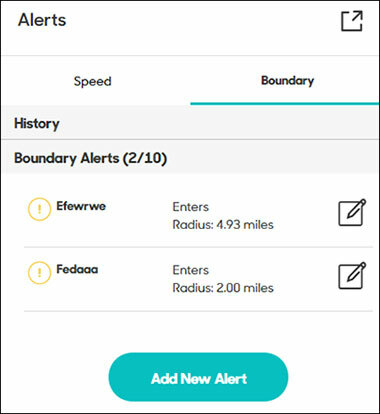 The name appears in the text of any alerts triggered. Select a specific mile radius in the Radius field. Boundary cannot be smaller than 0.1 miles. Use the + and - buttons (located on the bottom-right) to re-size the map.